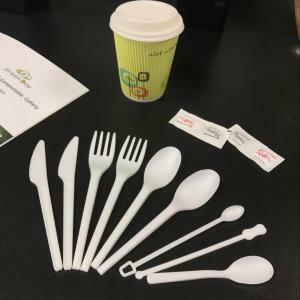 We are the factory specializes in 100% Compostable Cutlery ,which include Biodegradable cutlery-CPLA Knives,Forks,Spoons,Tea Spoons,Stir sticks and Sporks. Biodegradable PLA coffee cups with lids. Biodegradable PLA drinking straws Compostable sugarcane clamshell,cups,bowls,plates etc. biodegradable cutlery Material: CPLA is the new bio material based on PLA(poly lactic acid) and high heat tolerance up 185 F.
2.Heat resistance up to 185 F (degrees).